There isn’t a dearth of literature or perspectives on success – what it is, how to arrive at it, how to manage it and the list goes on and on. But reviewing and analyzing the broad theme of success within the context of leadership in Africa and the role of her young and emerging leaders is a subject that requires some deep reflection. Young leaders from Uganda, Rwanda and Kenya who are fellows of the Young and Emerging Leaders Project (YELP) which is a collaborative initiative of the LeO Africa Institute, the Konrad-Adenauer-Stiftung and Stanbic Bank explored this topic at a recently concluded 2017 second seminar series. The seminar gathered thoughts and created a unique platform for sharing insights with influential leaders from the private and public sector and the civic society space. Critical viewpoints were shared by David Mpanga, a partner at Bowman’s Law, one of Africa’s most acclaimed commercial law firms. Mpanga, whose conceptualization is success and leadership, is pegged to a sense of community impact challenged the fellows to put service to others above self. This, he argued forms the unwavering foundation of trust, responsibility and understanding which are crucial tenets for a progressive society. He also warned the fellows against moving with the tide of the bandwagon but often narrow understanding of success which focuses on the material accumulation of wealth. “Yes we need material possession, but this should be the least of our priorities and it should never be a limit to our truest essence of happiness”, he said. When materialism occupies a top priority in our lives, we lose our sense of moral direction and get consumed by indifferent urges” he continued. He also explored at breadth humankind’s susceptibility to the golden straight jacket definition of success contending that “we should always define success according to our own terms rather than conforming to societal standardization of success” he noted. Donnas Ojok picked up the conversation and explored “the self-definition” of success using the Greek philosophical tradition. “Know Thyself”, a Greek aphorism that was inscribed at the forecourt of the Temple of Apollo at Delphi and later on widely expounded by Socrates presents a fundamental philosophical question of knowing oneself. Donnas reiterated the Socratic argument that man’s other pursuits is laughable if they don’t know themselves well. Self-knowledge he emphasized enables us to be more productive, emotionally balanced and able to live happier and better lives. He also noted that Self-knowledge is not a one off journey but rather, a continuous process shaped by the social, economic and political context in which we live. He then called upon the fellows to examine their lives because “an unexamined life is not worth living”. During the seminar, important writings that provided deeper insights on leadership and success were also shared. This offered the fellows the opportunity to reflect on themselves and their role in shaping the leadership that the African continent requires. Reacting to Paul Kagame’s speech at the 2011 Young Achievers Awards in Uganda which reechoed the role of courageous, hardworking and innovative young people in promoting effective leadership and development, Benjamin Rukwengye, one of the fellows posited that Africa’s challenge is indeed the inability to creatively find unconventional solutions to the socioeconomic dysfunctions that continue to riddle the continent. As a solution to this challenge, Mr. Rukwengye shared about his initiative, Boundless Minds which aims to empower teenagers in their S.6 vacation with the right skillsets to be intellectually more curious, civically more aware and engaged and critically more thoughtful. Another fellow……also shared about his creative approach to promote urban agriculture through micro-gardens. Through the micro-gardening approach, schools are now turning to produce the required nutritious foods and pupils are actively being engaged to dig, plant, weed and do the harvest by themselves. Through this, “the negative perceptions of Uganda’s youth towards agriculture will slowly be eradicated”, Cleofash reiterated. Of equal importance were also the stimulating conversations with two industry experts from the education sector. 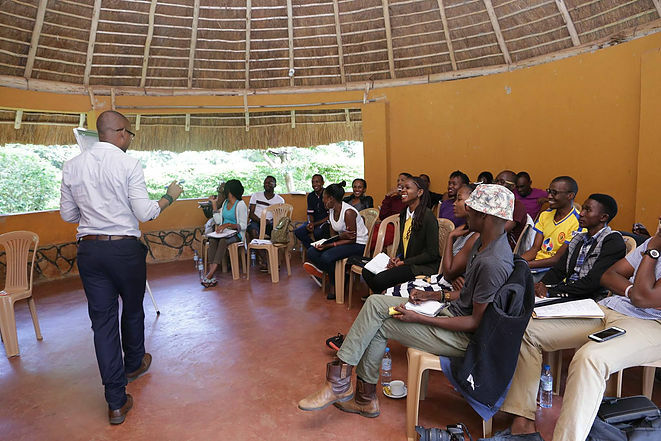 James Kassaga, the Co-founder and CEO of Teach for Uganda, a nationwide movement of solution-driven leaders working to end education inequity in Uganda shared with the fellows about successful nonprofit resource mobilization and organizational management. James called upon the fellows to define their organizational mission and vision because it helps to provide more clarity about the direction of their initiatives and strategies to create the kind of social impact they are aspiring for. He also reiterated about the importance of having a strong board to provide oversight guidance and advice, offer resource mobilization and networking avenues and hold the organizational management accountable. “As social innovators and dreamers, we always have this relentless passion that must be checked and tamed. A strong board enables us to do that” he emphasized. King Solomon Benge, a robotics enthusiast who started Fundi Bots, a nonprofit that empowers Ugandan students with innovative tech skills offered very refreshing but critical insights. He shared his recent pains and struggles ushered in by a confluence of personal and professional failures. “Pains and struggles are part of life. What’s important though is what you learn from them”. Benge also emphasized the importance of self-education and why every young leader must make it their top priority to be a lifelong learner. Himself a university dropout, Benge recollected his relentless quest to learn by reading books, watching documentaries and other educative films.